Joe Woods is in his first season as the 49ers defensive backs/passing game coordinator. He joined San Francisco after spending the previous four seasons with the Denver Broncos, two as the team’s defensive coordinator (2017-18) and two as defensive backs coach (2015-16). Throughout his NFL coaching career with the Broncos, Oakland Raiders (2014), Minnesota Vikings (2006-13) and Tampa Bay Buccaneers (2004-05), Woods has coached eight players to 15 total Pro Bowl selections. Additionally, his defensive back units have helped lead the NFL in passes defenses three times (2004 & 2015-16). In 2018, Denver’s defense finished in the top five in both passes defensed (82) and interceptions (17). LB Von Miller and rookie LB Bradley Chubb combined for 26.5 sacks as Miller’s 14.5 were the second-most in a single season in his career and Chubb’s 12.0 set the Broncos franchise record for the most sacks by a rookie. In his first season as defensive coordinator in 2017, the Broncos finished third in the NFL in total defense, allowing 290.0 yards per game. Denver and the Minnesota Vikings were the only two teams to rank in the top five in run defense (89.4 yards per game) and passing defense (200.6 yards per game) that season. Denver’s fifth-ranked run defense improved by more than 40 yards per game after finishing 28th in the NFL the year prior. Woods’ defense also held each of their opponents to less than 300 net yards passing. Prior to his promotion to defensive coordinator, Woods coached Denver’s defensive backs to first-place rankings in the NFL in passing yards per game allowed in both 2015 (199.6 yards per game) and 2016 (185.8 yards per game). The Broncos also held opponents to the lowest completion percentage (57.8), yards per attempt (5.99) and passer rating (74.3) during those two seasons. From 2015-16, the Broncos secondary led the NFL in defensive touchdowns (seven), as Denver’s defensive backs found the end zone on six interception returns and one fumble return in that timespan. Each of Denver’s four starting defensive backs made at least one Pro Bowl playing for Woods from 2015-16, including CB Chris Harris Jr. (2015-16) and CB Aqib Talib (2015-16), who were also named AP First-Team All-Pro selections in 2016. S T.J. Ward (2015) and S Darian Stewart (2016) also earned Pro Bowl honors while playing for Woods. In 2016, the Broncos secondary held opponents to the fewest net passing yards per game (185.8), yards per attempt (5.8) and passing touchdowns (13) in the NFL. Quarterbacks registered a 69.7 passer rating against Denver in 2016, as the Broncos joined the 2013 Seattle Seahawks as the only teams between 2012-16 to hold opponents under a 70.0 rating for an entire season. Woods joined the Broncos as the team’s defensive backs coach in 2015 as Denver finished first in the NFL in net passing yards per game allowed (199.6 yards per game), while the defensive backfield accounted for 11 interceptions, 56 passes defensed, nine forced fumbles and four touchdowns. The Broncos registered three interceptions and allowed only one passing touchdown during Denver’s postseason run that ended with a 24-10 victory over the Carolina Panthers in Super Bowl 50 at Levi’s® Stadium. Woods coached the Oakland Raiders defensive backs in 2014, working with veteran S Charles Woodson, who led the team with 160 tackles and four interceptions in his 17th NFL season. He also worked with CB D.J. Hayden, as he finished the season with 47 tackles and one interception making starts in eight of his 10 games played for the Raiders. Before joining the Raiders, Woods spent eight seasons coaching defensive backs for the Minnesota Vikings (2006-13). The Vikings finished in the NFL’s top 10 defenses in four of his first five years with the team, winning consecutive NFC North Division titles from 2008-09 and making an appearance in the NFC Championship following the 2009 season. With Minnesota, Woods worked with first-round CB Xavier Rhodes, who appeared in 13 games (six starts) and set a Vikings rookie record with 23 passes defensed in 2013. CB Antoine Winfield earned all three of his Pro Bowl selections (2008-10) throughout his career playing for Woods, recording 14 interceptions and 58 passes defensed in his six years with the Vikings. Woods originally went to Minnesota in 2006 as then-defensive coordinator Mike Tomlin added him to his staff after the two worked together in Tampa Bay from 2004-05. During his two years with Tampa Bay (2004-05), Woods coached a secondary that was led by CB Ronde Barber and CB Brian Kelly. Barber, who was named to the NFL’s 2000s All-Decade team, earned AP First-Team All-Pro honors following each of his two seasons playing for Woods. In 2005, the Buccaneers had the NFL’s top defensive unit (277.8 yards per game), which included the league’s sixth-ranked passing defense (183.1 yards per game). Tampa Bay finished 11-5 and won the NFC South Division title. Barber set a single-season franchise record for most tackles (120) by a cornerback and led the club with five interceptions. In 2004, Tampa Bay led the NFL after allowing 161.2 net passing yards per game. The Buccaneers also held opposing quarterbacks to a 77.2 passer rating. Barber was selected to his second career Pro Bowl after finishing the season as one of just four NFL cornerbacks to register at least three interceptions and 3.0 sacks on the season. Before joining the Buccaneers, Woods was the defensive backs coach for three seasons (2001-03) at Western Michigan University. He held the same position at Hofstra University from 1998-2000, helping the school make consecutive trips to the 1-AA playoff quarterfinals. Woods also served as defensive backs coach at Kent State University (1997) and Grand Valley State University (1994-96), and spent the spring of 1994 coaching linebackers at Northwestern State University.  He began his coaching career as a defensive backs coach at Muskingum College in 1992 and later became a graduate assistant at Eastern Michigan University in 1993. Woods played cornerback and safety during his collegiate career at Illinois State University. He was a team captain as a senior in 1991 and earned First-Team All-Gateway Conference honors following his final season. He also earned a degree from the school in criminal justice in 1992. A native of North Vandergrift, VA, Woods and his wife, Ellen, have three children: two daughters, Brianna and Danari, and one son, Geno.